Our main location with the largest staff is 6171 Helen C. White Hall (600 North Park Street). We see students by appointment at this location, and we’re often booked up several days in advance, so please plan ahead. Currently enrolled UW-Madison students can make appointments online. January 22-February 8: Monday – Thursday 10:00 a.m. – 5:30 p.m., Friday 10:00 a.m. – 3:00 p.m.
February 11-May 3: Monday – Thursday 10:00 a.m. – 8:30 p.m., Friday 10:00 a.m. – 3:00 p.m.
Finals Week: May 6, 7, 8: Monday – Wednesday 10:00 a.m. – 3:00 p.m. Directions. Helen C. White Hall is across the street from the Memorial Union and from Science Hall, on Lake Mendota. Take the stairs or elevators located to the left of the entrance to College Library. Upon reaching the sixth floor, turn left (from the stairs) or right (from the elevator), and then turn right down the corridor. The Writing Center is the first door on the left. Satellite locations will open Sunday, February 10 for the Spring Semester. First come, first served instruction. 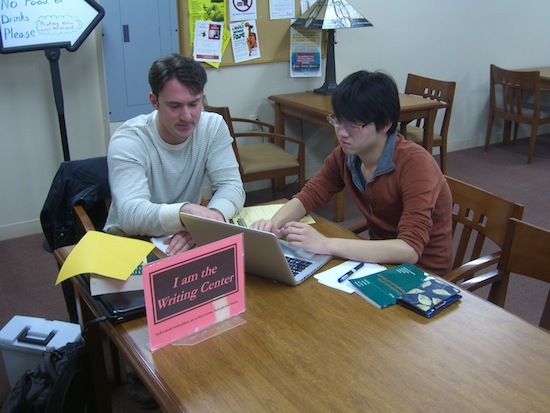 All of the Writing Center’s satellite locations use a sign-up sheet to organize our first-come, first-served instruction. 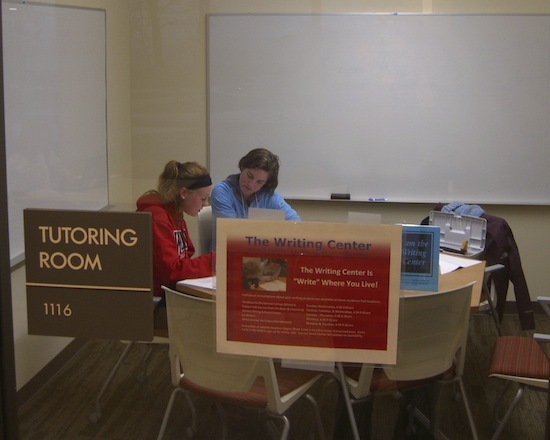 When the Writing Center instructor arrives at a location (typically 5 or 10 minutes before the listed start time), the sign-up sheet will appear and students who are waiting will be invited to sign up for a single 30-minute meeting with the instructor. In the evening, Writing Center instructors report openings on Twitter. To sign up for a reported availability, go in person to that location and add your name to the sign-up sheet. Location: We’re at Witte Hall, off the main lobby. Look for us at a table with the Writing Center sign! Location: We’re at the Red Gym, Second Floor, MSC Student Org Suite. Look for the Writing Center sign! Tuesday: 5:30 p.m. – 8:30 p.m.
Wednesday: 5:30 p.m. – 8:30 p.m. Location: You’ll find us in the Red Gym on the first floor. Look for the Writing Center sign! 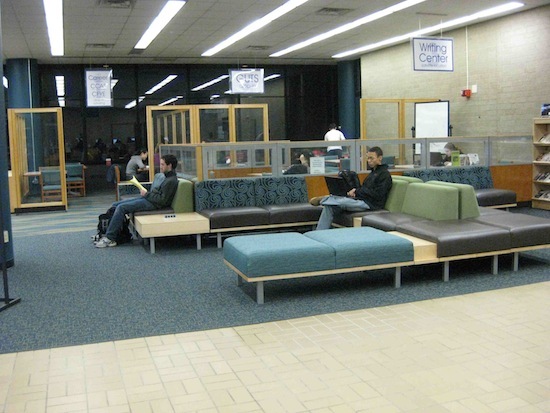 Location: The student services area is on the first floor of College Library, to the right of the entrance. Sunday: 6:30 p.m. – 9:30 p.m.
Monday: 6:30 p.m. – 9:30 p.m.
Tuesday: 6:30 p.m. – 9:30 p.m.
Wednesday: 6:30 p.m. – 9:30 p.m.
Thursday: 6:30 p.m. – 9:30 p.m. Location: Our table is on the ground floor, west corridor, near the library mall exit facing the Historical Society. Look for the Writing Center sign! 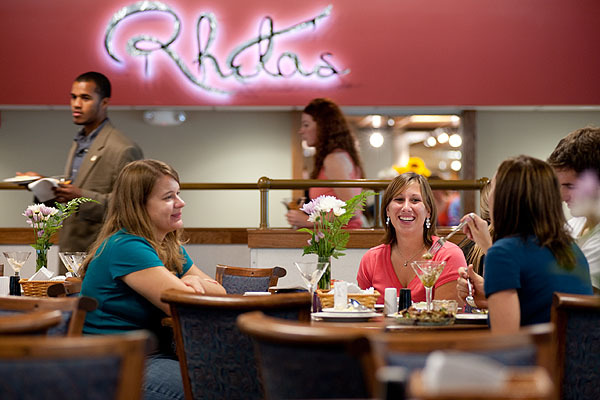 Location: Find us at Rheta’s, in the booths at the back (to the left when you walk in). Location: We’re in Tutoring Room 1116, down the hall from the Bean and Creamery coffee shop. Look for our sign! Location: Our table is near the East Campus Mall entrance, across from the Flamingo Run. Look for the Writing Center sign! 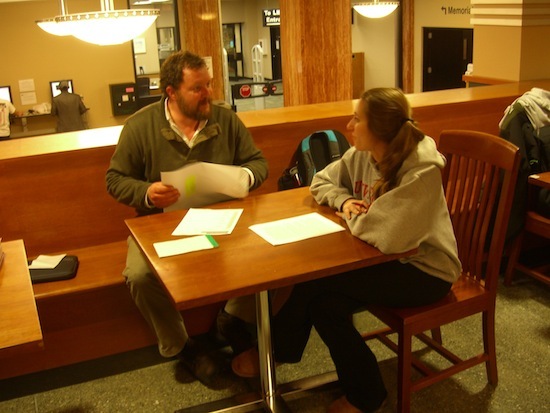 As a currently enrolled UW–Madison student, you can get feedback from a Writing Center instructor over email. The instructor will read your work and begin an email exchange with you about your paper, paying particular attention to your goals and concerns. What sort of response will I receive? Your instructor will help you identify 1 or 2 revisions that can significantly strengthen your work. As in a face-to-face writing conference, our time is limited. Instructors typically have 30 minutes per draft, so we will not be able to comment on every aspect of your draft in a single review. What kinds of papers can I send? Papers up 6 pages (double-spaced) are best suited to email instruction. We can occasionally accept drafts up to 10 pages (double-spaced), but these drafts take longer to respond to. If your draft is longer than 10 pages, try one of our other helpful services to set up a series of appointments with the same instructor. Can I work with an instructor via email on my thesis/dissertation? Unfortunately, because demand for email instruction is so high, we are unable to make continuous appointments to discuss long writing projects (senior theses, dissertations). For these longer projects, we recommend working with the same instructor on an ongoing basis over a long period of time. It takes that kind of sustained work for an instructor to understand a project and for the writer and instructor to work collaboratively. Dividing a long project into segments without conversation is not in a writer’s best interest and doesn’t match the Writing Center’s pedagogical philosophy. In our other locations we serve many students with longer projects, devoting much in person time to those students. Email instruction is devoted to students composing shorter pieces of writing. Just like in the main center and our satellite locations, we are not always able to help every student with each draft. If we are not able to accommodate your request, we will notify you as soon as possible. Fill out our request form carefully so that your writing instructor can understand your project and your concerns. Note: While we wish we could respond to every draft, due to the popularity of email instruction, we can only respond to one email draft per writer per week. Please choose the piece of writing most important to you for submission and make sure you read feedback carefully in order to apply our advice to future writing. We look forward to working with you! Request email instruction by filling out this form. Have a quick writing question? Do you have nagging questions about sentence structure? Are you not sure your thesis is clear? Is some grammatical rule causing you to lose sleep? If so, then help is on the way! Send your questions to the Writing Consultant! Simply fill out this form and you’ll receive a response via email within three business days. But if you have a question about documenting sources, why wait for an answer? Check out our website’s extensive information on APA, Chicago, MLA, and other styles, and find your own answer immediately! Our Writer’s Handbook also has lots of information on grammar, punctuation, and style. If you have a question about documentation style, please specify which style you’re using (e.g., APA, CBE, MLA, Chicago). The more specific and precise your questions are, the better we can assist you. If possible, give us an example. 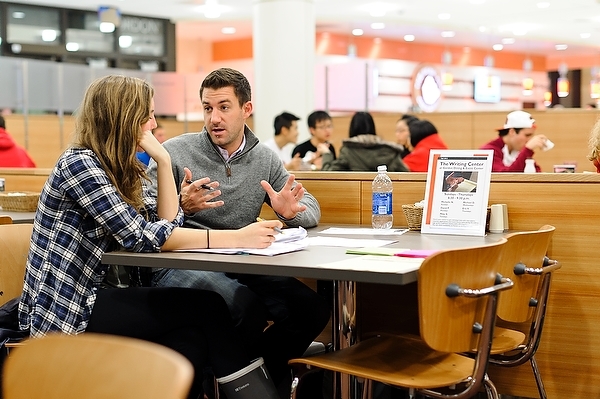 As a currently enrolled UW–Madison student, you can meet with a Writing Center instructor live using Skype and Google Docs Monday, Wednesday, and Thursday from 7:00–10:00 p.m. 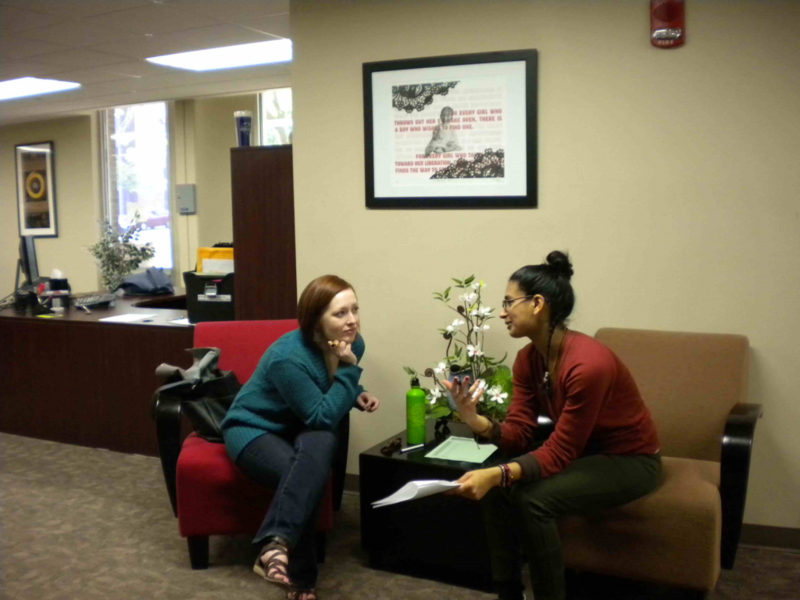 These appointments are very much like face–to–face appointments in our main center or at one of our satellite locations: they are collaborative conversations in which both you and the tutor ask questions, share information, and think through solutions. Appointments are available first–come, first–serve, and you can sign up Monday, Wednesday, and Thursday beginning at 6:45 p.m., fifteen minutes before Skype instruction begins, through our online sign-up sheet. Monday: 7:00 p.m. – 10:00 p.m.
Wednesday: 7:00 p.m. – 10:00 p.m.
Thursday: 7:00 p.m. – 10:00 p.m. In conjunction with our appointment policies, we have a limit of 1 hour of instruction per student per week with a total of 10 hours for the whole semester. As such, students are limited to one Skype appointment per week. When the video satellite is open (Monday, Wednesday, and Thursday from 6:45 p.m. – 10:00 p.m.), load the sign-up sheet and register for an appointment. When your time arrives, your instructor will ping you on Skype and begin the session! 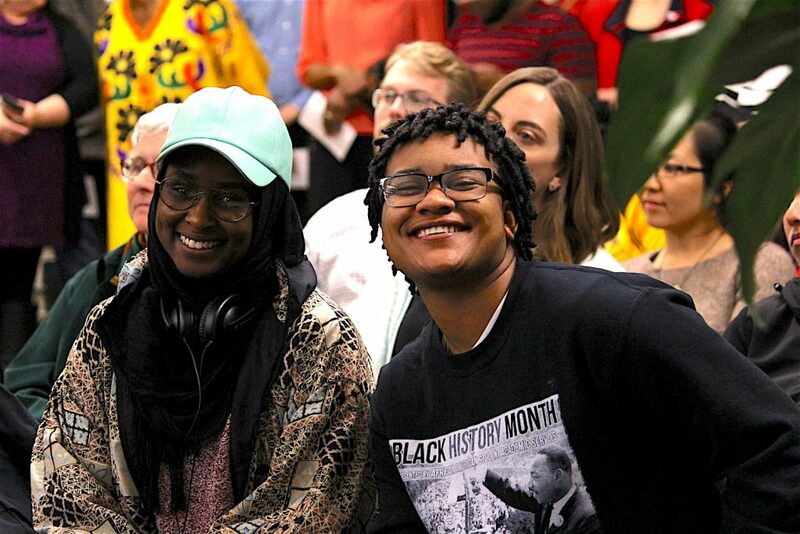 The Madison Writing Assistance (MWA) program offers free, one-to-one writing support for community members at libraries and neighborhood centers throughout the city. Our friendly, experienced instructors are happy to help people with their writing across a wide range of genres, including resumes, cover letters, application essays, grant proposals, creative writing, and various forms of life writing. MWA services are made possible through generous donations from the Evjue Foundation, the UW Anonymous Fund, Altrusa International of Madison, and the Leadership Trust Award of the UW-Madison College of Letters and Science Honors Program, along with administrative and program support from the UW-Madison English Department, the UW-Madison Writing Center, and our library and neighborhood center partners. For Spring 2019, we will offer free weekly writing assistance from February 4 through May 4. Please note that MWA services will not be available from March 18-24 due to UW-Madison’s spring break. To schedule an appointment to meet with an MWA instructor, please call the appropriate library or neighborhood center. Monday: 4:00 p.m. – 7:00 p.m.
Tuesday: 10:30 a.m. – 1:30 p.m.
Saturday: 1:30 p.m. – 4:30 p.m.
View Madison Writing Assistance in a larger map. To schedule an appointment, please contact the appropriate library or neighborhood center. If you have a question for Madison Writing Assistance staff, you can email us at mwahelp@gmail.com.